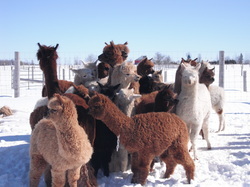 Alpaca Central was established in 2009 with the prime objectives of breeding to improve alpaca fibre quality and to promote education for the development of a viable, sustainable alpaca industry. Jean and Aldo Marascio and daughter Risa became involved with alpacas in 2007, purchasing their first alpacas after visiting numerous alpaca farms and diligently researching these fascinating and unique animals. Their learning curve into farming was steep, however once they left the amenities of their previous life in the city, they didn’t look back. Their new mantra became “Go big or go home” which seemed to fit everything they did, from the acquisition of the 100 acre farm complete with the century farmhouse and barns, to the expansion of their herd to over 130 alpacas. While they sometimes missed the comforts of the city, they heartily embraced all that came with life in the country and soon established themselves within the community and would never again find themselves with nothing to do! Jean became a regular vendor at the local farmers’ market and fall fairs and they hosted frequent open houses to introduce alpacas and their luxury products to as many people as possible. The on farm store 'Gallery 109' has embraced the local artisan community by inviting the artisans to share the venue as a permanent retail space to promote themselves to the public. Aldo established himself as the local shearer and has a regular and growing clientele throughout the ‘golden horseshoe’ shearing alpacas. Risa is a student at the University of Guelph majoring in Animal Biology and spends her summers managing the farm operation, the breeding program and getting the cria off to a good start. A key component of Alpaca Central’s business model is to continue to promote learning and facilitate education in all aspects of the alpaca industry. Fellow alpaca breeders and fibre enthusiasts are invited to spend the day participating in interactive sessions on genetics and breeding, fibre sorting, classing and grading, nutrition and pasture management, carding, dyeing and shearing. Networking between the participants is a natural outcome of the sessions and value add that further strengthens the alpaca community. Alpaca Central continues to stand behind the quality they offer, from proven bloodlines, outstanding service to luxury products.